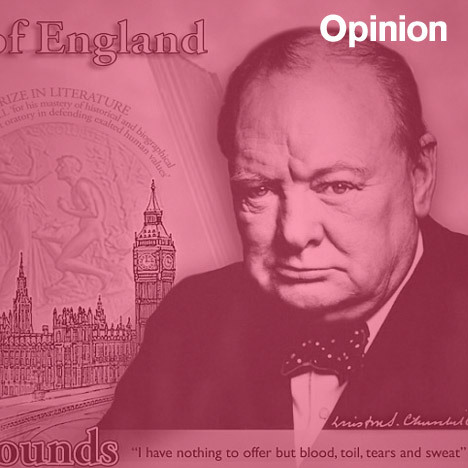 Opinion: as the Bank of England unveils the design of its new £5 note, Sam Jacob ponders the historic and cultural symbolism of money in this week's opinion column. Last week the Bank of England announced its new £5 note. In 2016 Elizabeth Fry (don't worry, I had to look her up too) will be replaced by a new design with Winston Churchill's jowly boat race plastered all over the great British Pam Shriver. Of course, we need new notes. Money gets worn out. It gets handled, dragged out of pockets, shoved in purses, rolled up, folded, scrawled on and so on. And as forgery gets smarter, the anti-forgery devices incorporated into currency need to evolve. But the changing cast of characters that play across our national currency also provide a portrait of the nation at any given moment. The design of currency is then a technical, cultural and conceptual project. Money first is a representation of value, a kind of floating signifier of the value it represents. It's both the value and the representation of that value simultaneously and locks value into its representation through the steps it takes to be unforgeable. While performing these complex sleights of hand and technical feats, money also acts as a piece of national pageantry. It sits amongst the accoutrements of state that include the symbols and bureaucratic paraphernalia of a state, somewhere between a flag and a driving licence. We know that money – as in coins and notes – isn't really real. It's just a physical manifestation of an abstract value. It is, in the great phrasing of a US customs form, a 'monetary instrument'. Monetary value itself is an invisible entity that can leap from one state to another with ease. It slips in and out of substances as though it were a restless supernatural spirit. We know the story of how money developed this supernatural power: how coins began as the thing of value itself, as lumps of value, actual pieces of gold for example, unitised. We know that this equivalence of substance to value shifted so that the coin referred to a value that was now held elsewhere. We know too how notes became a way of referring to value by acting as a promise that the actual material would one day change hands. And we know that this act of referred value came to mean something so significant that it gained a life of its own – the sign became a thing in itself. Money flipped. It changed from being the substance that contained the value to a symbol of that value, from the thing to a sign. As objects, coins and notes are pitted by the residues of this history and scored by the presence of value. Their design is a record of the ways in which value is manufactured and protected. Its surfaces construct the idea of value. They are embellished with symbols of nationhood, state, monarchy and culture that derive from the arcania of heraldic design, a language that links it to the sovereignty and government, symbolically tied to economic mechanisms that underpin the idea of money. Equally they protect value through the intricate lacings of so many security systems: inks and colours, holograms and watermarks, foil strips and paper, the fritted edges that once foiled those who would have shaved off slivers of gold. Filigree lines loop back on themselves with almost psychotic intensity, so fine that you can zoom in and in. Images break down into patterns like fingerprints as though money wasn't something you could actually draw with a line, only suggestively sketch. Its tentative quality is a matter of anti-counterfeiting but also perhaps an expression of the immateriality of value, graphically on the verge of immateriality, a point cloud that can only approximate the thing it is trying to represent. Money is covered with historical reference. Maybe it's the same kind of validation that banks once used when they were built in the form of Classical temples: historical reference somehow conferring significance. Churchill's image on a bank note then transfers his significance, his personality and historical narrative not only onto money, but into it too. It works as a form of cultural guarantee. Euro notes too seem to have the whole history of Europe backing them. They have images of bridges, arches and gateways that look quintessentially European. Except, look closer: that's not actually a Rialto or Pont de Neuilly! The landmarks depicted are not real things or places, they are things designed to evoke the sensation of European history and culture. They are imaginary renditions of Classical, Romanesque, Gothic, Renaissance, Baroque, Art Nouveau and Modern. It's the story of Europe told through an imaginary architecture. One can imagine the extreme lengths designers and their Eurocrat clients went to avoid national favouritism, to tell an inclusive story that all of the EU could feel part of. But one wonders if they also considered the narrative they were writing through this imaginary, non-existent Europa-heritage. For example, did they think of the implications of using essentially faked-up historical images as the face of money? As a thing that spends so much of its effort - so much of its surface and material quality - being authentic and non-fake? As an aside: oh how I'd love to build full-size replicas of these imaginary historical sites - a version of fake Europe so real that it would be indistinguishable from actual Europe as precipitated by, y'know, real events and people (aka, history). The aesthetic of money remains distinct even as it intersects with more contemporary design sensibilities like the recent British coins that fragmented the Royal Shield head over varied denomination coins if you arranged them in the right way, or Hong Kong dollars with their see-through plastic. Maybe the future of money is Bitcoin, the digital currency based on open source cryptographic protocols that has recently been in the headlines for the volatile fluctuations in its value. Bitcoin has internalised the visual and material security systems of physical currency into the complexity of its algorithmic generation - the so called 'mining' of Bitcoins. Its value is (if I understand it correctly) related to the computational labour of manufacturing it. Which seems far more appropriate, far more accurate a description of what contemporary money actually is than being linked to gold reserves. Right now Bitcoin is really only useful for buying sandwiches in Kreuzberg or illegal substances online. But perhaps it provides a far better, far more realistic depiction of value than those anachronistic notes and coins. Sam Jacob is a director of architecture practice FAT, professor of architecture at University of Illinois Chicago and director of Night School at the Architectural Association School of Architecture, as well as editing www.strangeharvest.com.